Vizianagarm MPEO 109 Posts Agriculture Dept. Notification at vizianagaram.nic.in. Vizianagaram District Agriculture Department MPEOs 2016 Application Form, Vizianagaram MPEO Posts 2016 Selection list, MPEOs Recruitment in Vizianagaram, Multi Purpose Extension Officer positions, MPEO jobs vacancy position in Vizianagaram district, Vizianagaram MPEOs Agriculture Total 39 Posts Contract Recruitment Notification and Application form, Last date. 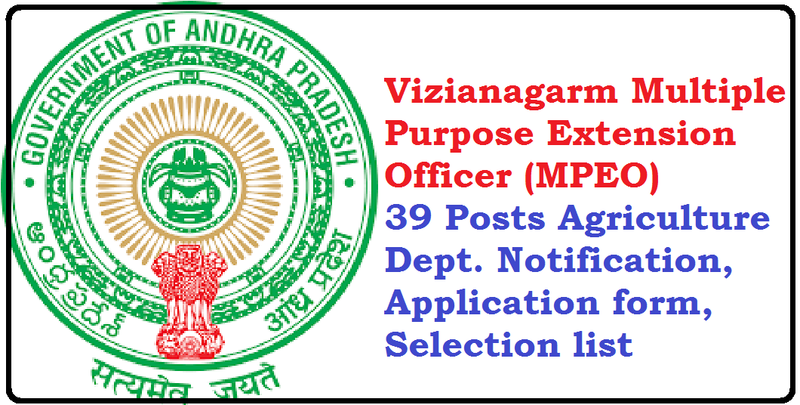 AP East Godavari District Multi Purpose Extension Officer notification, Vizianagaram Dist MPEO 39 Posts Notification, East Godavari District , mpeo contact 39 Posts notification Vizianagaram at http://vizianagaram.nic.in/. Recruitment of 39 AP MPEO Posts The Department of Agiiculture Government of Andhra Pradesh has issued a notification for the recruitment of Multi Purpose Agricultural extension officers In Agriculture Department. 2. Pass Certificate of B.Sc.,(Ag)., / Agriculture Polytechnic Diploma Holders. Ordinary B.Sc/MSc with Agriculture as one of the optional subjects studied in recognized universities in Andhra Pradesh. 25-06-2016 at Evening 5 P.M.